Dr. Roy Martina, MD is a Holistic Medical Doctor specializing in holistic therapies (Acupuncture, Homeopathy, Nutrition, Cancer Therapy, Psycho Neuro Immunology & Deep Change Hypnosis), a world-renowned martial arts world champion (8th degree Black Belt Martial Arts Grandmaster) and author of 86 books with numerous bestsellers he wrote to spread his knowledge. Many are translated into more than eight languages. His worldwide bestseller is titled “Emotional Balance.” (Hay House).He’s the Founder of Omega Healing and many alternative therapies such as RAPID (Allergy Treatment), Neuro-Emotional Integration (Emotional Trauma Therapy) and INTEGRA (Integrated Complementary Medicine). He is also a Business Inner Game Coach helping entrepreneurs become more successful. His goal is to bridge the gap between science & holistic therapies. His approach is based on combining Subconscious Neuro-Programming of the brain, Strategic Intervention Coaching Principles, increase the self-healing Intelligence of the Body, and accessing Universal Wisdom through Channeling. He has been teaching this all over the world for 30 years and has trained more than 350,000 people including doctors, teachers, therapists, coaches, and managers. He has collaborated with Deepak Chopra, Bruce Lipton, Debbie Ford, Jasmuheen, Peggy Dylan, Eric Pearl, Professor Albert Ignatenko and many others. Ignite Your Flame Retreat Their work has helped thousands around the world step into their innate power to make quantum leaps in whatever area of their lives they most want to improve: health, wealth, emotional balance, success, relationships and so much more. The Success Library, gain instant access to the Sales Journaling Prompts and start shifting your mindset today. When you see people transform that’s priceless. 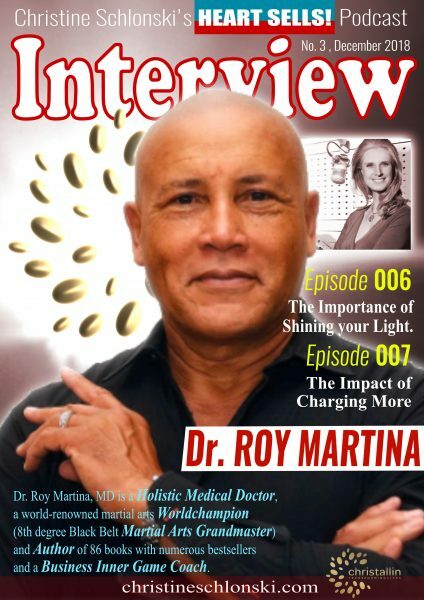 Hi Gorgeous, welcome to episode number six with our amazing guest, the remarkable entrepreneur Dr. Roy Martina. Hi, this is Dr. Roy Martina, you are listening to Heart Sells! with Christine Schlonski, enjoy. Here’s in a nutshell what you need to know about Dr. Roy Martina, he is a holistic medical doctor and a world-renowned martial arts world champion. Yep, that’s right. It’s both. He has an eighth-degree black belt in martial arts and is a Grandmaster but that is just not everything. He also is the author of 86 books with numerous bestsellers and he is a Hay House author. Today, he is a business inner game coach and he helps entrepreneurs to become more successful. He has been teaching all over the world for the last 30 years and has trained more than 350,000 people and has collaborated with Deepak Chopra, Bruce Lipton, Debbie Ford, Jasmuheen Peggy Dylan, Eric Pearl, and Professor Albert Ignatenko just to name a few. So let’s dive into this interview. I am so excited to speak to Dr. Roy Martina today and we definitely are going to cover how he has felt about sales. How he has strengthened his sales mindset into a sales success mindset. And yeah, how he got started from being a medical doctor to a business inner game coach. So let’s welcome Dr. Roy Martina. Hey Gorgeous, so excited to have Dr. Martina on and you just had an inside of his amazing, amazing bio. So Roy tell me, when you know you read your bio yourself, aren’t you impressed? I had to learn the commercial side of business, I believe, part of the success is to know how to present yourself. And my most inspirational story of ever read is of Jesus. And, and the story goes as follows that Jesus start to preach and, and so on but there were not a lot of people coming through, and maybe just small groups. So he knew he had to change this marketing. So then he started doing healing. And when he started healing people now he had hundreds and thousands of people coming to him. So even Jesus understood marketing way back then. And that inspired me because it when you’re a spiritual person, and you have a message to share, there’s one thing you need to master as well is, how do I get that message in front of the people that would benefit from my story. And this is the one thing I’m teaching also to entrepreneurs right now. And that’s why I’m so happy to be on your podcast, because, you know, it could make a difference, even if it makes a difference for one person, it’s already worked it for me. Yeah, Wonderful. Wonderful. And you have come such a far way. And, you know, when, when you started out, have you always been confident in selling your ideas or your services? Or was that something you actually really needed to learn and to shift your mindset. One of the most important things that I understood now is that most therapists and coaches and, and also some trainers, they are introverts. So if they, they would love to be in a room with them a person, and they’re fine, put them in front of a crowd, or they have to sell themselves, it’s a total disaster. And that’s also the same for me, it was I remember my first lecture that it was giving when it started my acupuncture practice. I was so nervous, I was really freaking out. And if I was not a martial artist, I would run I tell you, I would run I hated to be in front of the public and to sell myself to sell my services was the worst thing for me to do, and, and to learn how to do it in a way that it was, I would say, appropriate for the public and for myself, what has been a journey and until I understood, and that’s why I told the story of Jesus, that once I understood event, the messenger, it’s not about me, it’s not about my ego, it’s not about who I am, it’s about the message that I have to bring to this planet, and the people I’m going to help. So that gave me the courage once they understood that when I fight that part of me to come outside, I’m doing it for the right reason. And the second thing that’s really important, than to come out, become visible, has been the biggest personal and spiritual growth ever because it’s going against everything I stand for. It’s counter-intuitive, it feels bad, it’s not something you like to do. Let me talk about the things I love to talk about. Right, but not about selling or marketing, or those kinds of things. So even taking money from my clients I couldn’t do. So I would have a receptionist, I would send them to them and to deal with the money so I could focus on what I was doing right now. So that journey of becoming visible, coming out was the much more important journey for my growth, that the journey to become a holistic doctor or to do whatever I’m doing so and, and I really want to stress that for a lot of the people that probably will be in your audience who will recognize being more the introvert not the extroverts that that bridge to develop your extrovert expert part is your biggest spiritual growth you will ever be able to do to do it in a way that it corresponds with your integrity with who you are, what you stand for, that’s a real discovery. And it’s something I would recommend to everyone on this planet who is not an extrovert and a natural salesperson, which we also have. And we always jealous of them, because we look at them. And we just say, I wish it was so easy for me. And it’s not, it never is it, it will never become super easy. But you become more comfortable over time to go out and do it. And then also to be confronted with people who are not, you know, take the against anything, you if anyone wants to sell something to always people who believe he shouldn’t be selling and there’s always people believe if you’re doing anything on personal development, or spirituality, it should be for free. So you get these kinds of, I would say challenges as well on your path and those are wonderful challenges to help you to grow to become the most powerful self you can be. Yeah, wow. Well, that was so powerful. Thank you so much for sharing. And I’d love for people to see that, you know, those people we are looking up to like, was all the accomplishments that you have, and the business that it was a struggle to get there. Because from the outside, it looks easy. And there’s, they seem to be some natural salespeople. But for the most part, I have never seen like a natural salesperson that didn’t put any effort and were just able to ask for what they wanted, the amount they wanted with total ease. So usually, that is a skill that can be learned and can be embraced. Absolutely. And, and I think also one big part of, of that skill set is the inner work you have to do about your self-worth, you know, and, you know, if you’ve asked a little bit of money, okay, you can live with that. But when you realize the value you’re giving to people, and that’s where we often don’t, don’t realize that imagine a coach or a therapist, you are actually helping a person to transform the lives to another level. And that’s priceless, there’s no amount of money that can do that. And if you put it into the perspective, or let’s say, or soul travels, we come to this planet to become the best version of ourselves. But we get stuck over and over and over. And think that’s why I see that when I did my research on how many times we on average, reincarnate on this planet, we are over 400 times. And then if you know that this planet is kindergarten, and you get stuck in kindergarten over 400 times it really depressing is depressing. And part of it is that we don’t learn our lessons, we get stuck in an uncomfortable comfort zone. And we don’t have enough pain to move out of it, we have the desire to move out of it. Yeah, that’s that’s why I created this podcast because I wanted to people for people with those amazing gifts to actually shine and to show up for the other people that need them. And I know we talked about it a little bit earlier you have this amazing program kick start of the year. So it’s even in three languages German, English, and Italian, so well. And you know, because January is right on the corner ran the program is in February. So if you want to check that out, go to www.christallin.com. And I’m also linking the link that you can choose into the show notes. So you have a place to go when you go to christineschlonski.com/podcast, you’ll find all this information. Um, so Roy, one, one question I would have regarding that shift in your mindset. So when you figure it out, that you can’t get your message into the world if you keep hiding and keep avoiding sales, where did you actually start to do that mindset shift? Because for most people it feels so heavy and difficult and not even doable? Like where can people start? Well, I think everything starts number one in your mind, your mindset. It starts with understanding that we, we, we have skill sets that can be learned. And it’s not like a lot of people believe some a lot of things are gifts if they, if there’s some people, are natural, easier for them, like an extrovert will be natural, easier to do to do sales. But if you’re an introvert, it’s doesn’t mean that you cannot develop your extroverts side. That’s what I had to do, I have to do to go against my own, let’s say feelings and develop another side. Because I realized in my practice, that if I don’t go out there and explain what I’m doing, number one, people will not come, you know, of course, you have word of mouth with which is great. But I don’t have the patience to sit in a practice for one year before my practice is going to be very successful. I want to start right away. So for me time, you can only spend it once, right. So. And one of the tricks that I’ve used in the past also is to offer people the first half hour for free, so we can see if we are a match for each other or not. And we would have like, what I call patients appreciation days in my practice, where they can bring friends and families we share stories of healing and those kinds of things. So you start first with very little small with telling your story. I think this is very important. And as a therapist, we often make the mistake that we want to tell people we can help everyone you know, and when you say that you don’t get the right people to come because people want to hear specifically that they can be helped. So everyone who’s watching or listening is always asking what’s in it for me? What can I get out of this? So one of the things I always tell therapists to do is to first choose an area of your practice that you really enjoyed, it gives you a lot of passion, or gives you the best results. For example, in my case, it was allergies. I could guarantee most people with allergies that they can get almost 100% cure, but the world has to know it. So once I went out, I got publication magazines and so on and so on, people start to come with busloads and then and then word of mouth begins. And nowadays we have two types of marketing. One is offline, any of online and not everybody is moving online sometimes is smart again, to move offline to before example, start doing little lectures just for your clients and they can bring friends and you explain certain things that you do. You rent out a space, then for 30-40 people, you start talking, you start learning and you start making offers to the people like you know like most practitioners make the mistake also that they sign up for just one appointment, which is no commitment. It’s better to say, Hey, listen, what I did in my practice was people get 10 treatments and after 10 treatment still be one session for free evaluation. And we would look what did we achieve in these 10 treatments, what are the next steps we need to make in order to get where you want. And 50% of the people may be already done. And then you have a closing session. And for the other people, it might be explaining what still needs to be done. So it is just integrating these little step into your practice. And the other thing is to become visible also on things like Facebook or Instagram where you telling your story. And you can tell stories of your clients that you are successful in helping. And so these are the little steps that we have to make in these times that we can go outside and step by step become also more skilled at the extrovert to side with been sales and marketing. Yeah, yeah. So, so true. So do you remember the very first thing that you’ve ever sold in your life? Gorgeous. What a beautiful example that Dr. Roy just shared with us from his personal experience, not liking sales, not wanting to ask for money, having actually people ask for him to being now totally confidence and knowing his value and the value he brings to the world and how he shares his amazing gifts with all of us. If you want to get more of a personal experience, you need to check out the kickstart that he offers for the next year at christallin.com check it out see if the program is for you. Because it helps you to become more congruent with all of your ideas and to actually have a wonderful 2019, where you are not in your own way so this is one of his really, really successful programs at delivered in three languages English, German, and Italian. So I hope you have a look and you tune in if this is in alignment with you. I’m really excited, thank you so much, Dr. Roy Martina, for being on the show. and you gorgeous you can start today by shifting your or sales-mindset into a sales-success-mindset. Just hop on over to christineschlonski.com and get your sales journaling prompts. They are waiting in the success library for you. And you can just download the PDF and start journaling today, creating your new reality where sales is fun and money is flowing to you because you’re delivering such amazing value that the money is just the energy exchange. Have fun. Enjoy and tune in to the next episode where we will continue the amazing interview with Dr. Roy Martina and you will find out so much more. Have a wonderful day and bye for now. [03:22] When I look at my bio, it is like looking at three people doing one life together. And I’ve been now adapting and changing because life teaches you more wisdom. [04:16 ]I had to learn the commercial side of business. [06:46] Until I understood, and that’s why I told the story of Jesus, that once I understood it’s the messenger, it’s not about me, it’s not about my ego, it’s not about who I am, it’s about the message that I have to bring to this planet, and the people I’m going to help. [09:10] There’s always people believe if you’re doing anything on personal development or spirituality, it should be for free. So you get these kinds of, I would say challenges as well on your path and those are wonderful challenges to help you to grow to become the most powerful self you can be. [10:37] You are actually helping a person to transform the lives to another level. And that’s priceless, there’s no amount of money that can do that. [12:28] The healing (your service and products) is Yin and the Yang is going out and tell people or allow people to know what you’re doing. [14:51] Roy’s advice, where to start with your mindset shift. [16:41] So everyone is always asking what’s in it for me? [18.58 ]Roy talks about his first thing he ever sold and how he deals with total nervousness. [22:55] We need to be able to take care of the money part. Because that’s very important to really be able to live a life that’s comfortable, especially when you give so much so you need to find that balance. Empowerment Notes, Join the Empowerment Notes our weekly newsletter and I’ll make sure you have all the info you need to be empowered. Spiritual & Practical Steps to Increase Your Sales and Create True Wealth Without Losing Your Authenticity.